P90X is a 90-day workout and diet program that has taken the nation by storm since its launch in 2003. The P90X system has been hailed by tens of thousand of individuals as life changing, and helping their bodies reach a new level of fitness that they never thought possible. This program has a very diverse following that includes everybody from full time moms to professional athletes. Even more unique then it’s following, is that the entire training program doesn’t require you to step foot in a gym; all you basically need is a room with a TV. Tony Horton is the creator and front man of the P90X program. The fitness guru originally started his search for the “perfect system” when he was a personal trainer and doing stand up comedy gigs in Los Angeles. During Horton’s time out in LA, the CEO of Beach body, Carl Daikaler, approached him about creating a new kind of workout program. This program was to be centered on developing a workout that anybody could see incredible results in a short period of time, and could be utilized by someone regardless if they were out of shape or a world-class athlete. Muscle confusion is really the epicenter of the entire P90X program. The primary principal of muscle confusion is to make sure that your body employs constantly different movements and uses different muscle groups to make sure that everything is being physically developed in your body. It requires individuals to alternate between types of workouts, and focuses on short intense movements of speed to build the body of a functional athlete. This method is always on display in P90X through various resistance-training exercises that employ different reps and resting periods, along with variations in workouts. The P90x program avoids using heavy weights or isolating muscle movements at all during the course. A big reason for this is because over time if you only continue to workout the same muscles, your body is unable to develop them anymore, and you begin to reach a physical plateau. Once your body becomes accustomed to a workout, effectively that workout loses its effectiveness and is unable to produce any more physical gains for you. In order to continually increase stamina, endurance, and muscle development, there has to be a variety exercises that “surprise” the muscles. As such, P90X ensures that you never have the same type of workout back to back. This is accomplished in P90X by having many different exercises employed, and changing up the sets and reps to avoid your body from becoming use to them. This change is constantly happening by working through 12 different training segments that are included in the P90X workout. It effectively employs new moves that keep your muscles “guessing” on what is going to happen next. This allows your body to never reach a plateauing point so that your muscles and strength are always developing. Disc 1: Chest & Back Emphasizing two upper body exercises for strength and definition. Disc 2: Plyometrics Ah Explosive cardio routine where you have a lot of jumping which is proven to improve athletic performance. Disc 3: Shoulders & Arms A combination of curling, fly and pressing exercises to strengthen your Shoulders and Arms. Disc 4: Yoga X A combination of balance, breath , flexability, and strength which will calm your mind and enhance your physique. Disc 5: Legs & Back A total-body workout with lunges, squats, and pulls which will help you forge a foundation of strength. Disc 6: Kenpo X This punching and kicking routine will give you an intense cardio workout which will help with balance, endurance, and coordination. Disc 7: X Stretch Increase your athleticism and prevent injuries with this program. Disc 8: Core Synergistics Create a strong core and build strength, to support you whole body. Disc 9: Chest, Shoulders, & Triceps Sculpt your arms, chest, and shoulders with this upper body development routine. Disc 10: Back & Biceps Get toned arms and a powerful back with this workout. Disc 11: Cardio X A low impact fat scorching workout to help you feel an intense calorie burn. Disc 12: Ab Ripper X Tone and tighten your abs and sculpt a strong six pack. The exercises of P90X consist of 12 different selected targeted workouts that utilize the system of muscle confusion. A key component of P90X is plyometrics. Plyometrics utilize explosive jumps, and incorporate cardio routines that help develop athletic endurance for all around body function. The P90X program also builds up your chest and back with a workout that focuses on your upper body. It has a similar work out session dedicated to your back and arms that uses resistance and curling to increase muscle strength. A unique twist of the P90X program is its emphasis on stretching and yoga for two of its core workouts. The stretching program helps to keep your joints and muscles limber, and protect them from over use and injury. This crosses over into the Yoga segment of P90X that causes an incredible amount of core strength development through plyometric moves, which can give your body a rock hard physique. The yoga portion of P90X also emphasis’s the development of mental strength to help push yourself in the rest of the program, and how to stay in the workout mentally. The Kenpo X and Cardio X workouts of P90X implement an intense cardiovascular workout that focuses on keeping your body lean and ripped. The Kenpo is different forms of boxing and kicking moves that are found to be helpful in increasing your balance and hand-eye coordination. The primary function of the kepno and cardio segments of P90X is to create the strong lung capacity of an endurance athlete, who instead of running miles pounding the road is actually doing low-impact exercises in their living room. The P90X programs also has segment with an emphasis on developing your biceps, legs, and back. These sections consist of doing lunges and squats to develop your glutes and lower back muscles. After doing these workouts overtime, you can add substantial power to your jump. However, the bicep segment is paired more with the back section and places an emphasis on powerful flexes and resistance pushing to build up the bicep muscles and develop definition. As with all workout plans, something would be missing without having a training segment dedicated to sculpting rock hard abs. P90X accomplishes this with their section called the “Ab Ripper”. The Ab Ripper section was created to burn off the fat that builds around the middle section, and then helps tone the entire abdomen. It also utilizes different movements of the core that help to develop the lower abdominal muscles together with your obliques, which are often the hardest to strengthen. The great thing about all these workouts on the P90X program is that the most you will ever need are dumb bells, resistance bands, and a pull bar. That is the entire inventory needed for a P90X workout. The P90X program can be used for anyone looking to lose weight and build lean muscle through its intense workouts and diet program. However, is not only for losing weight or dropping some inches around the waist. If you are looking for bigger and more cut muscles, the P90X program was also developed with those goals in mind, and with slight adjustments in the workouts, it can be accomplished. The P90X program also places an emphasis on developing a body for athletes who want to reach the next level of physical performance. The P90X workout even has variations in it that can make an athlete bigger, faster, and stronger by building up muscle tissue through the use of explosive moves and intense resistance maneuvers. The varying workouts and large demographic of fitness enthusiasts and athletes is what has made this program so popular. Tony Horton also attributes the success of P90X because it is a results based program that really brought muscle confusion to the mainstream. Which makes sense due to the popularity of the program across the world, and that its method is to surprise your muscles on a daily basis so that they have no choice but to constantly develop. Tony Horton’s infamous saying during this P90X filming is “Do your best and forget the rest”. That seems to be the constant theme of the entire P90X program, as it requires you to push your body to the maximum physical point it can handle on every workout. If done properly, you will have a session six out of seven days a week that will give you a workout that will work out all your muscle groups, and leave you exhausted at the end (if you’re doing it right). Yet, even on the “off day” you still have the option of doing the “StretchX” session, which may not as intense as the other segments of P90X, but it will still give you a solid workout. Deciding if P90X is right for you can only be a decision that you make. However, with over 3 million DVD’s sold it has become the most successful commercial workout ever created, and continues to be a relevant and effective workout program for more then a decade after its release. It is a program that is recommended to try if you are deciding on a lifestyle change, and want to get into the best shape of your life. And if you’re feeling really bold, P90X also offers an advanced course called P90x Plus that will take you to a whole different level of physical fitness and mental energy! Have you done P90X? If so why don’t you check out P90X2 or P90X3? Why do they need P90X? You want to lose weight With a rigorous workout and a nutrition plan, you can get a lean body by burning fat. You want to build big muscles With a targeted approach to every muscle group in the 5 focused routines you can build those muscles up. You want to improve athletic performance A great cross training routine to develop increased strength and cardio capacity as well as increase reaction times. You want to get motivated With fierce challenges, you will regain your competitive spirit. You are a woman who wants to get stronger There are modificiations to help you get strong and toned while letting you keep you lean and sleek figure. 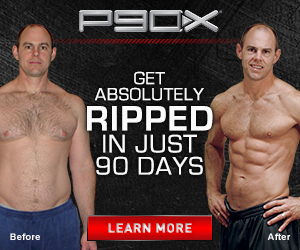 Want to buy P90X? There are a few options to buy this program. This is the core P90X system with the 5 Workouts on 4 DVD’s you can also find the P90X Spanish Version Here. With the P90X Peak Results Package you get the full DVD set of the package above as well as Chin Up Bar and ChinUpMax tool (helps offset body weight for chinups). You also get a month’s supply of Results and Recovery Formula and 3 resistance bands you can also find the P90X Spanish Version Here. With the Ultimate Kit you get everything in both of the prior kits as well as Powerstands and 3 Advanced Workouts.